You are looking here at a broad range of technically different implementations of modern Website design and development and Graphic design projects which were created since 2002. All newly developed Websites are based on design mock-ups developed in rapid prototyping with UI/UX wire-frame design. We also offer website hosting services utilising a variety of Hosting Service Providers, please see our Website Hosting Packages. And offer you the most reasonable domain name sources as well, please see our Domain Name Packages. Simply contact us for a free quote! Click on picture and use navigation to see slides! 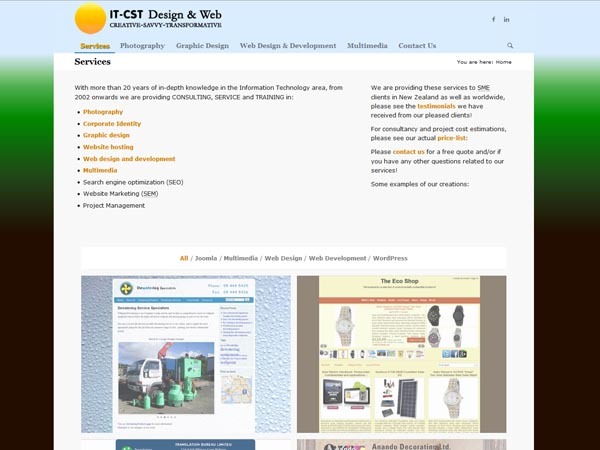 Being in business in New Zealand for quite some time and venturing more into WordPress required a new web-presence for IT-CST. It is based on the latest WordPress Content Management System using XHTML and CSS design, PHP development and MySQL database technology. Like Joomla WordPress provides a huge choice in extensions and customisable tools or plug-ins as they are called for any Web 2.0 need within one surface. Plug-ins like User registering and administration, Customer Relationship Management, Content sharing and altering, Calendar application, complete e-Commerce Solution, Bulletin Board, RSS feeder, Collaboration, Forum and plenty of other functionalities are modular and can be added and configured as per requirement. And a host of SEO and Online Marketing tools which makes WordPress the ideal platform for pretty much any business venture. For this project I have customised the Enfold template for my needs and added and configured a slide-show. It adheres to "responsive" web design standards making it automatically adapt to different screen resolutions. 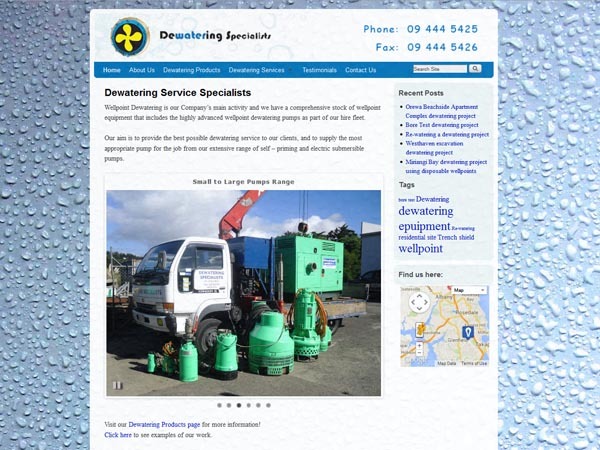 A business website to show case their services as dewatering specialists. Also in this case the WordPress CMS platform was used to provide the owner with a modern web 2.0 look and feel and implemented i.e. post slide-shows and Google maps, in a cost efficient manner. This website design project utilised the Weaver II framework, CSS styling and a couple of other plug-ins which required configuration and customisation. We also provided domain name and website hosting services for this project. An e-Commerce solution to sell a selection of sustainable products from the Amazon online store and is another test case for different online marketing strategies. The WordPress CMS platform is also in this case the best choice for SEO and online marketing related functionality. We employed a ready made template with the integrated Amazon shopping functionality which we had to configure and added the articles accordingly. We have to still do some design changes which has not a high priority at moment. The template is already "responsive" so it automatically adapts to different screen sizes. A sub-domain was created and our hosting services were utilised. This is a one page project for a translation service. The requirements were to create a one page website with contact form integration to protect from spammers. It is based on the latest HTML5 and CSS3 standards and adheres to "responsive" web design standards to make it automatically adapt to different screen resolutions. And is naturally optimized for actual SEO requirements. 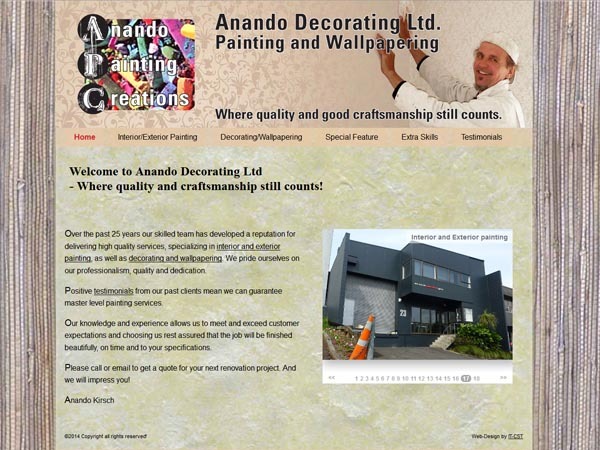 A completely redesigned website for a craftsman offering painting, decorating and other related services. Since July 2014 it is no more serviced by us! The tradesman required a new platform to show case his services and skills in a more modern and engaging way. Hence I suggested and was asked to implement a slide-show. It reached a publishing state by End of October 2013 and is optimized for actual SEO requirements. A business website development for a Corporate Apparel provider showcasing his services to the wider Auckland business community. At first the requirement were to create a 6 page website presence, but grew to a 22 page website. It was also important for the client to be able to update their change for themselves and that it is allowing to extent its base functionality. We decided to create a new Website using Joomla CMS, which provides for all that and is future proof. The overall development process took less than a week and reached a publishing state by End of May 2013. It is built on State of the Art standards and optimized for actual SEO requirements. This website development for an Indian Musician is showcasing his services and performances in Indian Classical Art. He is offering also Chanting and Kirtan classes. First the requirement was to update an existing Website adding new music and video footage, but it was on an older standard and would not fulfil another requirement to allow the owner to make his own content changes. I decided to create a new Website using WordPress CMS, ensuring it is future proof and SEO optimised. The overall development process took so far 59 hours and reached a publishing state by April 2013. It is built on State of the Art standards and optimized for actual SEO requirements. I also applied our hosting and domain name registration services. Was mainly created to test out different online marketing strategies but evolved over time into an information platform sharing alternative news and research of various topics, structured in a categorised form. We have later added The Eco Shop to it. The best platform for this is by far the WordPress CMS providing all the required SEO and online marketing related functionality. As all our projects this also is built on State of the Art standards and optimized for actual SEO requirements. We supplied our hosting and domain name registration services for this project. More than a dozen of specialised plug-ins/extensions were integrated and configured. This is a business website development for an artist, health and beauty consultant who offers ayurvedic massages, energy tough healing sessions, health and nutrition consultancy and organic skin care products. She is offering also chanting and meditation classes. There is a gallery of her art work as well as a presentation of dances. By the time the project matured the requirements changed and we decided to switch from a custom build CMS to WordPress CMS as a basis to provide the required functionality and future proof development adaptations. The overall development process took so far 96 hours and reached a publishing state by May 2012. It is built on State of the Art standards and optimized for actual SEO requirements. I also applied our hosting and domain name registration services. This is the website you are looking at, which is based on the latest Joomla Content Management System using XHTML and CSS design, PHP development and MySQL database technology. It provides a huge choice in extensions and customisable tools for any Web 2.0 need within one surface. Extensions like User registering and administration, Customer Relationship Management, Content sharing and altering, Calendar application, complete e-Commerce Solution, Bulletin Board, RSS feeder, Collaboration, Forum and plenty of other functionalities are modular and can be added and configured as per requirement. I have altered a standard Joomla website design template for my needs and added and configured a slide-show. It adheres to "responsive" web design standards to make it automatically adapt to different screen resolutions. This is a business website development for an international travel agency which conducts worldwide tours to all exotic and special places. This was built from scratch within 147 hours and finished by January 2012. It is built on state of the Art standards and optimized for actual SEO requirements. The main challenges were to create different website design layouts for all the different pages, the navigation elements and different forms. Again a lot of the required technical skills I had acquired from previous projects and former training before Unitec and based on that I could refine my Joomla know-how. I was responsible for the technical implementation and set-up of test environments, website hosting, the Flash animation programming, research and debugging of extensions for backup, file administration and forms. Being the senior most group member I was also the team leader and project Manager. My Partner was responsible for the System Analysis, Logo and Web design, implementation and configuration of extensions, like Google Maps and forum, photographs, menu and texts design and form creation. This project was about customizing a Wordpress template from Pagelines, which required know-how in the use of the WordPress environment, the Pagelines template, as well as CSS styling. The main challenge was to understand the template website design structure to be able to customise the design accordingly to the needs of the client. WordPress is a CMS based on PHP and MySQL programming, with XHTML coding based on a mainly table-less design. 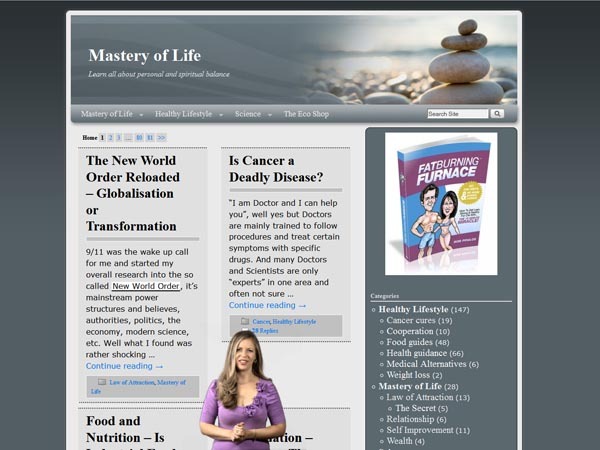 This project was about creating a CMS to allow registered users to create and share articles. This is also a business website design for a travel agency which conducts New Zealand wide tours for German tourists. I have taken over this project in Jan. 2011, it was initially created in 2003 and had only basic HTML coding standards, so there was a lot of reconfiguration required to get it to HTML 4.01 Transitional. Although it had been optimized for keyword search it needed also to be optimized for actual SEO requirements. Furthermore a couple of new webpages needed to be integrated. This is the homepage of Anando Kirsch, a multi-talented artist and tradesman, who wanted all his different art work and services to be represented. I just was given his business card and made from that the logo and overall colour scheme. 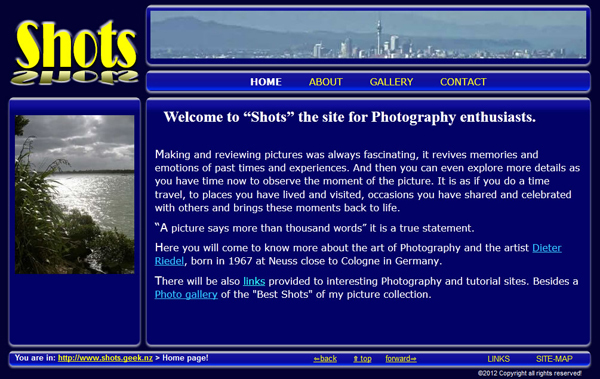 Shots is a web design presentation for a photography enthusiast/professional. 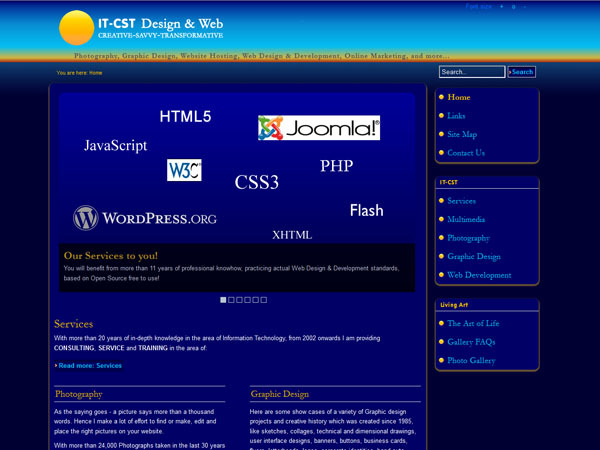 XHTML coding with central style sheet (CSS) formatting. It was a redesign project of their website built on wordPress and an e-Commerce module. Picking up the coding from the previous developer was not a breeze. And the complex wordPress integration with their shopping solution, re-work of graphic templates, a tight time schedule and changing web design demands made it quite challenging. This web development project was about creating a CMS to allow registered users to publish articles. An unresolvable challenge was to make PDF files load within the page on a Firefox Browser, which I did not follow up since. CSS Zen Garden is based on the CSS structure of Mezzoblue CSS designs which presents what CSS can be used for. This study project was a show case of my skills as a Web Designer and Photographer based solely on XHTML and CSS. I used a photograph of mine as a background and changed the CSS design elements accordingly. It was submitted in June 2008 to Mezzoblue website but was never selected to become a show piece for CSS web designs, but maybe because they stopped to list new ones in April 2008. Goldway International represents a website project for a Hotel. 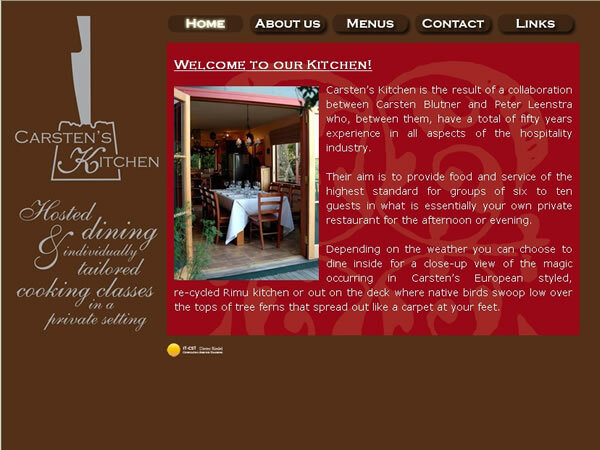 This business website was set-up to promote a small but world class cuisine on Waiheke Island. The owner and his associate asked me to create a homepage similar to their flyer. Although the graphics were provided, I had to convert them and make them suitable for website use. One main focus was to keep the dial up clients in mind and therefore the file size small. I stopped supporting it when my co-operation with “The Islands Computer Guy” ended in July 2007. This was my first New Zealand based web development project where I designed and created a homepage to convey the owner's business interests. I took almost all photographs and was responsible for the concept, layout and design, inclusive the creation of the animated GIFs. Here I also had to keep the dial up clients in mind and therefore the file size as small as possible. This is my previous homepage, which was based on Joomla 1.0 Content Management System (CMS) and its PHP design based on MySQL database technology. It provided a huge choice in components and customisable tools for any Web 2.0 need within one surface. Components like User registering and administration, Customer Relationship Management, Content sharing and altering, Calendar application, complete e-Commerce Solution, Bulletin Board, RSS feeder, Collaboration, Forum and plenty of other functionalities are modular and can be added and configured as per requirement. I have altered a standard web design template for my requirements and added content mostly via the in-built Editor and reviewed and corrected the HTML code which is automatically created. It needed to be replaced since the program code has become outdated and was replaced with a new version. The following Intranet websites are part of an information platform to support the knowledge exchange of Mirochip developers, technicians and scientists. 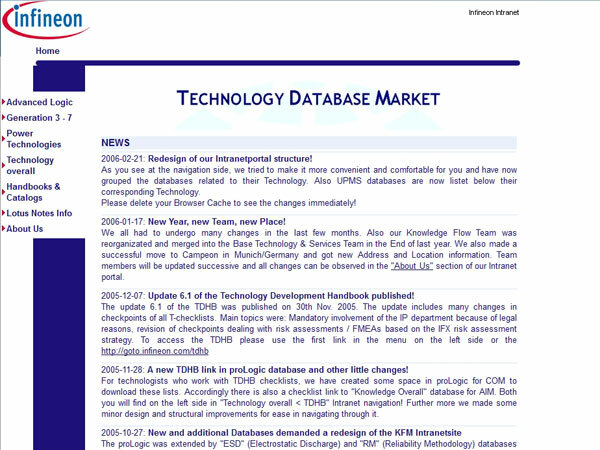 When I was working at Infineon Technologies Inc as a Knowledge Flow Manager, I took over also the intranet website development. In the beginning there were 113 pages and navigational pages. When I left we had 137 pages and navigational pages. Represents the activities and workshops of Silvana H. daCunha, a body worker and therapist. I stopped supporting it in March 2006 just before I moved to New Zealand and therefore has changed again by now. This is my first business web development project where I had to set-up a simple web design platform for a collector of historic porcelain art, with the main focus on art. The content and the pictures were provided and I designed the web pages and optimized the pictures.